2-Lp set released in 1972. Included as an "original" album due to two 1972 arrangments: Show Me and Swedish Rhapsody. In 1951, soon after Percy Faith came to Columbia Records as its musical director, a position somewhere between Mitch Miller, who was the A&R man, and along list of singers in search of hits, Percy found a song for himself. As a Columbia artist also searching for his first hit, he had a right to keep it for himself. As Mitch’s musical director and hit-song hunter for the rest of the roster, he had an obligation to give it away. But the music was Brazilian, there was no lyric, and there was already a recording available by the composer, Azevedo. Percy showed the music to Mitch, but he kept it, wrote an arrangement which would feature a guitar with his concert orchestra, and took a taxi to Columbia’s 30th Street studio, an ancient church whose shell offered the best recording sound in New York City. In a dark corner of the old church before the start of the session Mitch and Percy discovered a harpsichord, closed and locked, ready to be trucked away behind the lady who had just completed her Bach album. Without a qualm worth remembering, Mitch and Percy picked the lock on the instrument, pushed it under a microphone, and featured it, instead of the guitar, on Delicado. Percy had his first hit, Mitch a new sound, and somewhere a lady harpsichordist never knew the difference. But there is more to a hit than three minutes of accidental gold. Like all success stories, it begins somewhere else, and, usually, it leads to something even better. That Percy should have chosen an unknown Brazilian melody in the first place seemed surprising for a Toronto-born musician trained as a serious pianist. Yet, as far back as Percy can remember, he has been excited by the rhythms, the pounding and scratching of the music of Latin America. Snowbound in Canada, he wrote tropical arrangements long before he ever ventured south of Chicago. Delicado for Percy Faith was a natural choice. Its successors were to become a major part of his international reputation. A few years after Delicado, when Percy Faith was established as a major artist on singles and albums, he returned to the music of Latin America to record a gold album of the music of Mexico. Called Viva!, and filled with songs among the most beautiful in the world, it also included the Mexican Hat Dance popping with whipcracks. And, now identified with Latin American music, he continued with another successful album, this time the compositions of Lecuona, the Cuban writer of Malagueña. One important facet of a brilliant career had been revealed when the lock on a harpsichord was picked. A new direction for Percy Faith was forecast soon after the success of Delicado when six feet of manuscript paper reached him from Paris. The motion picture “Moulin Rouge” had opened abroad with a theme some 80 measures long by the French composer Georges Auric. The music went the rounds of New York publishers and record companies, all of whom rejected it as being too long. Finally, and with tacit approval to make a few changes, Percy picked out 32 measures and wrote the arrangement of what was to be called The Song from “Moulin Rouge.” It was Percy’s first million-selling single and clearly an invitation to search the scores of other motion pictures for themes suitable to his 45-man orchestra, a group of musicians which has always included veterans of big bands, jazz stars, and a sprinkling of concert masters—a virtuoso orchestra. Percy continued to record motion-picture themes with consistent success for the next two decades, choosing such compatible examples as Tara’s Theme from “Gone With The Wind,” and winning a Grammy award for his recording of Theme from “Romeo and Juliet.” The story of his greatest hit of all, Theme from “A Summer Place,” includes the usual twists of fortune which seem to accompany unique moments. In the late Fifties he was offered a contract to record for the then-new Warner Brothers Records. The proposal was made more tempting by an offer to score several Warner Brothers pictures. After careful consideration, Percy decided to turn it down in favor of remaining with Columbia where he was by then a major artist certain of a long and profitable career. Among the list of forthcoming Warner pictures he would have scored if he had accepted the offer was “A Summer Place,” and soon afterward the theme for this picture, written by Max Steiner, was brought to Percy. The thin line which separates the creative arranger from the composer in a musician like Percy Faith is often crossed and, usually, the listener is unaware of the crossing. A Faith arrangement is a composition in all but melody, and often that too, and this imprint of his own on every performance accounts for the immediate identification his music enjoys. Percy has been crossing the composer line for a quarter century, sometimes intentionally, sometimes in spite of himself. An early example, which would have earned a gold record award had it not been the back side of another gold record, The Song from “Moulin Rouge,” is Swedish Rhapsody. Accompanying a 30-minute television show in the early Fifties was a lengthy composition by the Swedish composer Hugo Alfven consisting of Swedish folk themes woven into a concert piece. When the music attracted listener attention, Percy sent for it, discovered the themes it contained, and adapted them to a shorter piece, for which he was given composition credit with Alfven. His recording of Swedish Rhapsody, which by now has become more popular than its companion song, completed the success. Percy has continued to compose. In the gold-award album Bouquet, which featured for the first time his string orchestra, the title song is his. Another album which won the coveted gold award, Themes for Young Lovers, was a successful single of a Faith composition called, of course, Theme for Young Lovers. His theme for “The Virginian” has been played so often in so many parts of the world that he could, if he would, write music for horses, too. One of the prime sources of American popular music during the past half century has been the Broadway musical theatre. Record stars have been feasting on its songs ever since Jolson recording Swanee, and there were never more songs to choose from than in the early Fifties when Percy was fashioning his own career. But until he returned to the 30th Street studio to record the score from “Kismet,” there were no successful instrumental albums of such scores. It was believed, logically, that listeners wanted lyrics with their show music but, perhaps, the Borodin music was so good, or, perhaps, Percy’s arrangements were lyrical enough. At any rate, his album of the music, including Baubles, Bangles And Beads, was a success too big to have been accidental, and s it led to yet another fertile field for Faith. Percy followed the score from “Kismet” with an even more successful album of the music from “My Fair Lady,” from which Show Me is taken for this collection, as well as beautiful albums of Rodgers and Hammerstein music from “South Pacific” and “The Sound of Music.” And if it is true that a familiar song is often more appealing when its lyrics are played rather than sung, when a more universal language is used, then Percy Faith’s catalog of musical theatre will endure. As the Fifties turned into the Sixties, music turned also, and the songs of a new generation were often beautiful and meaningful. Equally important for a man with a large orchestra, many of these songs could be played by strings. By the mid-Sixties Percy was playing the new music, adding still another dimension to his imposing talent and another audience for his records. After his Themes for Young Lovers won its gold award, (I Will Follow You in this collection also comes from that album), he adapted Jim Webb’s MacArthur Park for his orchestra. Then, because poetry had entered music of the decade, Percy added a girls’ chorus to his orchestra. Yellow Days, Angel of The Morning, and Windy, for the latter two of which he won Grammy nominations, feature the Faith chorus and orchestra. 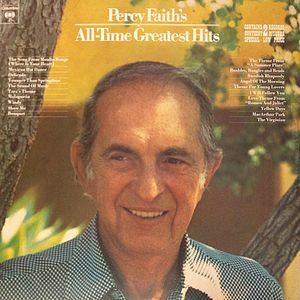 This attractive collection of Percy Faith hits is more than a score of records. It is the essence of nearly a quarter century of an illustrious career. It is the recollection of a hundred albums and a half dozen important directions his music has taken since Delicado. And, in retrospect, it is the explanation of his place in our music. His talents are all here: the inseparable talents of composing and arranging, the stylish sweep of his strings, the impeccable selection of repertoire. Few artists have equaled his popularity on records. Fewer still continue to surprise. The problem with this collection is that the title and liner notes would lead the listener to believe that these are the original recordings — the "hits." "Delicado" and "The Song from 'Moulin Rouge'" are the stereo re-recordings for later albums. "Swedish Rhapsody" and "Show Me" are new recordings of new arrangements. While all very pleasant to listen to, it is confusing to the listener expecting the originals as they remember them.